Do we need digital graveyard stories? The front page of the July 15 Minneapolis StarTribune offered a story about QR codes on gravestones. QR codes are those square, black and white icons on a variety of products that you can scan with your smartphone to receive more information. 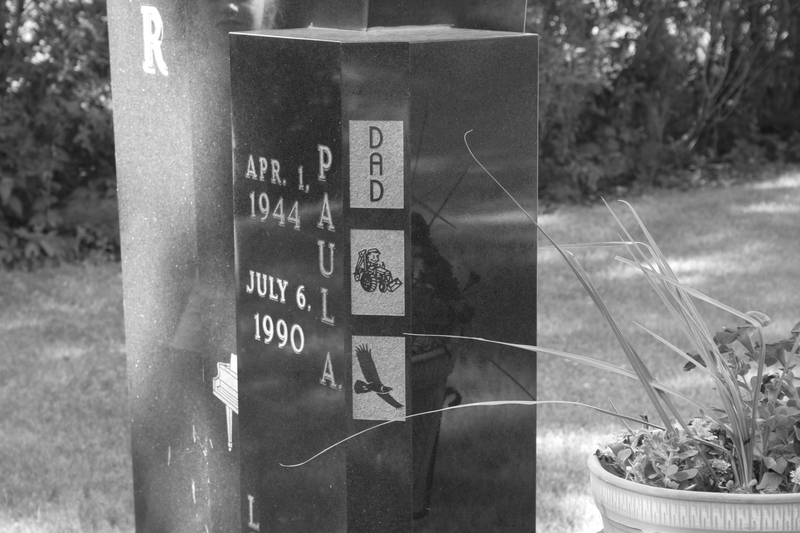 On a gravestone, QR codes can host photos, videos, or a story about the deceased. I have mixed feelings about QR codes on gravestones. On one hand, they have the potential to make the cemetery experience an even richer one. They can reach an audience who values a more interactive experience. I equate it to children who may not readily pick up a paper book, but they will sit down with a digital version that contains audio and video. As long as children are reading I’m for it, and if we need something “exciting” to draw people to cemeteries, great. I happened to have written in entire book based on my emotional connections to gravestones throughout the years. My memoir, We’ll Be the Last Ones to Let You Down, will be out next spring. The QR codes on gravestones cause me to worry about the loss of imagination in our culture. This is just another example of having stories handed to us. Mainstream Hollywood movies use easy-to-comprehend storylines and a plethora of explosions. Video games deliver similar packaged stories, complete with visuals, graphics, and audio. At times we seem afraid to use our imaginations, as we surround ourselves with multitasking at any given moment—television on, laptop open, smart phone at the ready, music pumping in our ears. We’re too assaulted by the media and drowning in textual conversations with people that we don’t give ourselves time to imagine. Cemeteries are filled with stories that can be intuited even without QR codes. I encourage you to find those stories. Well, it’s bound to come. And they won’t endure the way the old tombstones did, just as physical books are a perfectly perfected medium and very durable compared with e-books. But I’d probably watch a few and get creeped out! Richard, you’re right–it could get a little creepy after a while! Well. I’m torn about this because I was so touched by the idea of writing one’s own obituary. But this seems…creepy. You said it best: Cemeteries are filled with stories that can be intuited even without QR codes.